Recent natural storm slab avalanches and other signs of instability below treeline on Andesite Peak. Driving up to Donner Summit we saw recent avalanche activity of storm slabs on steeper slopes near the road. Once we set out breaking trail we created minor cracking within the storm snow. We dug our first test pit and saw unstable snowpit test results that matched the storm slab snow surface cracking signs. 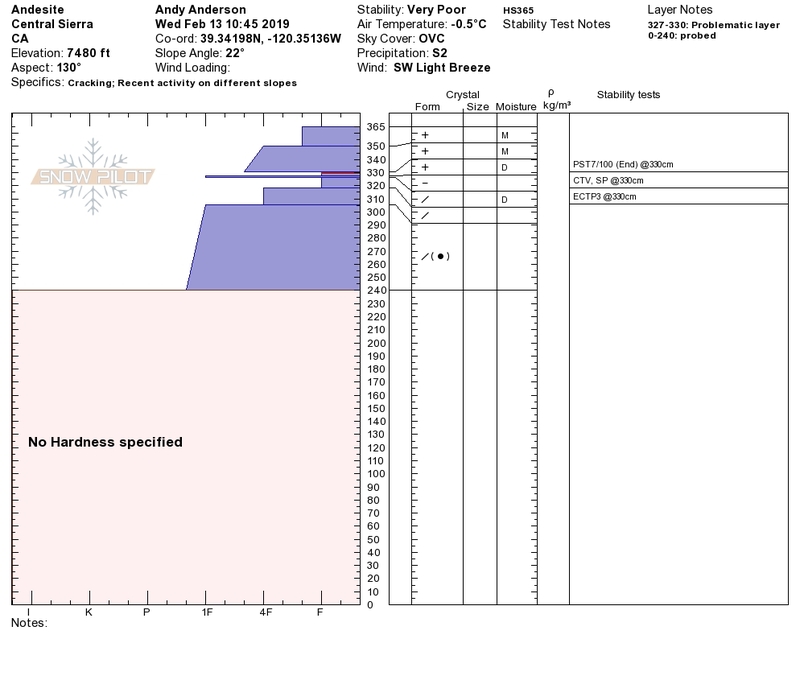 Failures in the pit were occurring on a layer of lower density storm snow from the first couple of hours of this storm (4F+ hard slab over F hard new snow layer). This was 3 cm above the old/new snow interface. Moving up towards avalanche terrain we were able to trigger long shooting cracks and see evidence of natural avalanches that had run earlier this morning and were now becoming covered by storm snow. A second test pit near two below treeline natural storm slab avalanches again identified the storm slab instability. Weak layer depth matched the crown depth of the avalanches. Near the summit of Andesite Peak, we saw no new wind slab avalanches. Descending from the peak we confirmed that we had seen plenty of evidence of instability and should continue to avoid travel in avalanche terrain. Precip was mostly snow while out on our tour in the 7,200' to 8,200' elevation range. We experienced one short period of freezing rain. Driving back down from Donner Summit we descended into rain around 6,900'-7,000' at about 2pm. Long shooting crack on storm snow instability.